I’m continuing my fall kick with a great recipe that is tasty, easy, healthy, and will impress your guests. – Pre-heat oven to 350 F.
– Place water in the bottom of a shallow, glass 9×12 baking dish (about the length of your fingertip). – Place the acorn squash halves face down, so the flat surface of the squash is submerged in the water. – Bake squash at 350 for 35 minutes. – Remove squash from the oven and place each section, face up, in its own, small bowl. 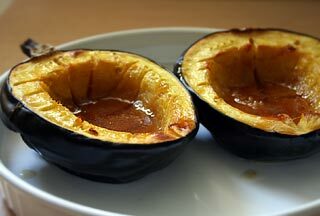 Put pat of butter and brown sugar inside the bowl-shaped acorn squash. Serve immediately. What are some of your “wow” recipes that are also easy and healthy? I’d love to mention them here.